PORTAFERRY RNLI rescued a fisherman from the sea after his vessel sank off the county Down coast. The volunteer lifeboat crew responded to a Mayday call this afternoon (Wednesday 18 September) following a request from the Coastguard to go to the aid of the man aboard a fishing boat that was reported to be sinking fast. 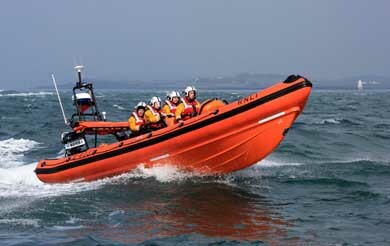 The Portaferry lifeboat has saved a fisherman whose boat sank in rough seas off Strangford Lough. A spokesperson for Portaferry RNLI said: “The call was received at 12.30pm and the crew launched the Blue Peter V, the station’s Atlantic 85 inshore class lifeboat at 12.40pm. 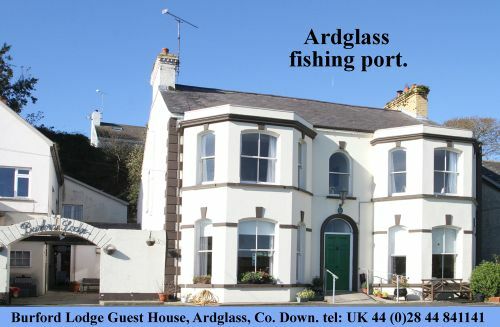 “They were called to an area close to Butter Pladdy, about three miles north east of Strangford Bar just off Kearney Point in county Down. “The lifeboat arrived on the scene at 1.04pm, by which time the 7.1m fishing boat had sank. The lifeboat crew began a search for the man who had been on board. Weather conditions at time presented rough seas with Force Five to Six winds blowing but visibilty was good. “The fisherman was located at 1.15pm, at which point, a member of the lifeboat crew entered the sea to assist the casualty into the lifeboat. The casualty was subsequently winched into the helicopter from the lifeboat and flown directly to Musgrave Park Hospital in Belfast for treatment. The fisherman had been wearing a personal flotation device. Speaking following the rescue, Leonard Lawson, Portaferry RNLI Deputy Launching Authority said: ‘It is at times like this that the quick response of our volunteer crew members combined with their training and skill, save lives at sea. The lifeboat was launched within minutes and thankfully the casualty was located shortly after the crew arrived on the scene.